SUNY at Binghamton received a A+. 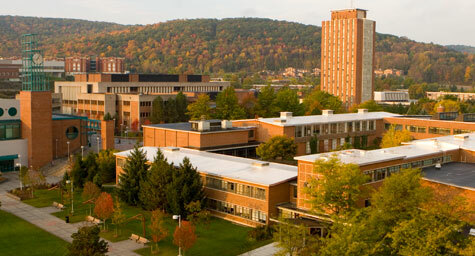 Binghamton University offers a top-notch education at a state-school price. Pre-professional programs, most notably in psychology, accounting, and nursing, are particularly strong here, and students say on-campus activities are varied and plentiful. Describe the type of student who should not attend SUNY at Binghamton and explain why. What is a typical SUNY at Binghamton student like? Describe the type of person that should attend SUNY at Binghamton. What are the top 3 reasons someone should attend SUNY at Binghamton? What was a typical SUNY at Binghamton student like in high school? Describe the type of person that should attend SUNY at Binghamton. Has become one of the premier public universities in the northeast. Student body comes from around the country and the world, though mostly from the New York City area. Binghamton receives nearly 11 applications for every slot in its freshman class. Offers a high quality education at a bargain price. Binghamton is proud to be ranked among the elite public universities in the nation for challenging our students academically, not financially. The result is a unique, best-of-both-worlds college experience. Our academic culture rivals a first-rate private university -- rigorous, collaborative and boldly innovative -- while our campus culture exemplifies the best kind of public university experience: richly diverse students, active social life and deep engagement with the community. What are the top 3 things that students do for fun at SUNY at Binghamton? The average student pays $14,914 for tuition, fees, and other expenses, after grants and scholarships. Learn more about financial aid at http://www2.binghamton.edu/financial-aid. Estimate the net price for you at http://www.suny.edu/howmuch/netpricecalculator.xhtml?id=2&embed=n&headerurl=www.binghamton.edu/npc/logo.png&cssurl=www.binghamton.edu/np. The typical (median) early career salary of SUNY at Binghamton graduates is $47,200, according to Payscale. SUNY at Binghamton participates in the NCAA Division I-AAA for college athletics. Want more info about SUNY at Binghamton? Get free advice from education experts and Noodle community members. How can I find out more about research on high-temperature superconductors at Binghamton University?